Joshua Tree National Park is a relatively new US national park, being officially set up in 1994, but its story goes back much further and is one of gold fever and untamed wilderness, a story of a land carved by desert winds and the insatiable appetite for gold, a story of gain and of loss. The legend of gold prospector Johnny Lang, a man who devoted his life to pursuing gold and avoiding the law, is a local favourite. He founded the Lost Horse Gold Mine, made and lost a fortune, fought on-going rivalries with local ranchers and is remembered at his grave, which is one of the park’s landmarks. The Lost Horse and Desert Queen mines with Keys Ranch remain great hiking destination points, with choices of trail length and difficulties. 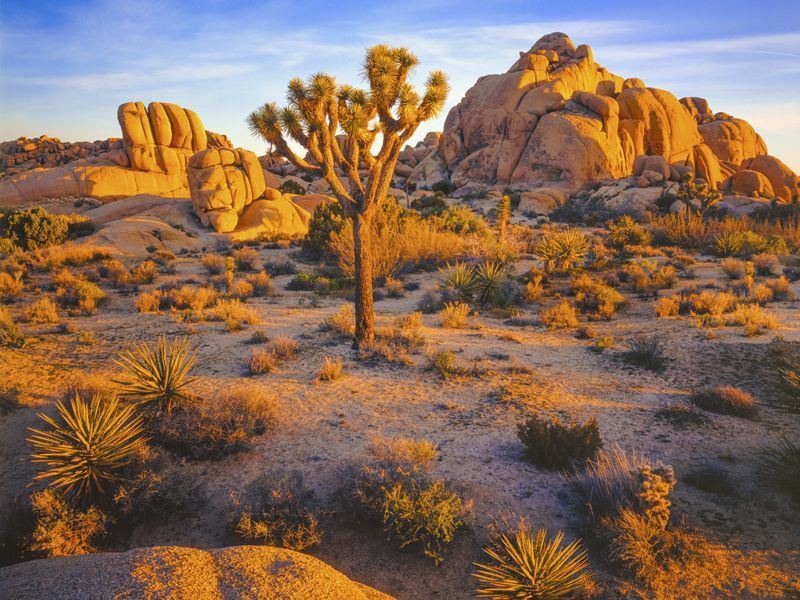 Joshua Tree National Park is huge, covering some 550,000 acres of beautiful and rugged wilderness. The Joshua tree itself epitomises this landscape and is an iconic statement; beautiful to look at but get up close and you will find a hard, unremittingly harsh experience that must be respected. There are two main ways of exploring into the Joshua Tree National Park, either from the north via the towns of Yucca Valley, Joshua Tree and Twentynine Palms or continuing east from Palm Springs on the Christopher Columbus Transcontinental Highway (Route 10). Hiking through the brutal heat of a desert summer’s day Joshua Tree can appear a defeated landscape, beaten down by extreme temperatures, sudden torrential downpours of rain and the weathering of ages to the end result of barren rock. Look again however and you see a land of fragile balance from the local herds of bighorn sheep to the six species of rattlesnakes that call Joshua Tree national park home. There are nine excellent campsites in the park that are open all year round including; Jumbo rock, Indian Cove, Hidden Valley and Black Rock. Joshua Tree National Park is actually made up of two much larger ecosystems, that of the Colorado Desert (part of the Sonoran Desert), occupying the eastern half of the park, and the higher Mojave Desert. Oases dotted throughout the landscape abound in wildlife and stand like green islands within the barren sea of sand, twisting mountains of rock and exposed granite monoliths. For all its harshness, the desert is a land of subtlety and life. To the close observer, a tiny flower bud or a lizard’s frantic dash reveals a place of beauty and vitality. Take your time as you travel through Joshua Tree National Park as the desert provides space for self-discovery.